Ed Morrissey at Hot Air posted an article yesterday about what is happening in the Central Valley in California. 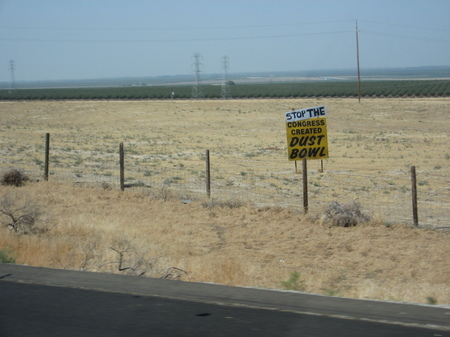 This is a picture I took on my vacation last summer while driving through the Central Valley. As you can see from the picture, the former ‘breadbasket of the world’ doesn’t look as if it is producing much. Well, there’s a reason for that. What happened? The government got involved. Because of a small inedible fish called the delta smelt, water which had previously been delivered to the Central Valley through irrigation was cut off for seven months of the year. This not only impacted farming in the region–it had other serious negative effects on the area. I’m not against protecting the delta smelt–I am sure it is a very nice fish (even though you can’t eat it), but I believe that we have to look at the entire picture here. I am sure some very well paid engineer can come up with a way to protect the fish and water the farmland. If we don’t start growing in the Central Valley again, none of us will be able to afford to eat! Yesterday Hot Air reported that Israel has discovered a natural gas reserve off its coast. The field is estimated to be about sixteen trillion cubic feet of natural gas. At this point I must issue a disclaimer–I am a stockholder in a company called Zion Oil and Gas that is drilling for oil in Israel. I firmly believe that the Middle East oil resources are probably not limited to Arab lands. Anyway, the article at Hot Air deals with the potential impact of the discovery of this field of natural gas on Middle East politics. The Wall Street Journal also reported on this discovery. Ratio Oil Exploration LP, an Israeli oil firm, owns a 15% stake in a giant offshore gas field called Leviathan, operated by Houston-based Noble Energy Inc.
“Noble confirmed its earlier estimates that the field contains 16 trillion cubic feet of gas–making it the world’s biggest deepwater gas find in a decade, with enough reserves to supply Israel’s gas needs for 100 years. “Earlier this year, Finance Minister Yuval Steinitz said he was considering changing terms retroactively–meaning the government could extract better terms on previously assigned leases. Noble and Israeli oil executives went on the offensive. “A retroactive change would be “egregious” and “would quickly move Israel to the lowest tier of countries for investment by the energy industry,” Noble’s chief executive, Chuck Davidson, wrote Mr. Steinitz in April. “The company enlisted high-level negotiators, including the U.S. State Department and former President Bill Clinton, to lobby against any change. “Mr. Clinton raised the issue in a private meeting with Israeli Prime Minister Benjamin Netanyahu in New York in July, according to a Clinton aide. “Your country can’t just tax a U.S. business retroactively because they feel like it,” the aide said Mr. Clinton told Mr. Netanyahu. Maybe President Obama should rethink the way he has been treating Prime Minister Netanyahu! The situation in the Middle East just got more complicated–Lebanon is also exploring offshore for gas. We have added a ton of potential money and energy to an already unstable situation. That may not be good. Today’s New York Post reported that sanitation workers in charge of clearing the snow-covered streets purposely slowed the clean-up process to protest budget cuts. City Councilman Dan Halloran (R-Queens) stated that a group of sanitation workers visited him and confessed to the plot. This is a disgrace. These sanitation workers should be handled the same way Ronald Reagan handled the air traffic controllers when they went on strike in 1981–he fired them for breaking the law (As federal employees the controllers were violating the no-strike clause of their employment contracts.) The sanitation workers did not go on strike, but their actions resulted in the death of at least two people when medical emergency responders could not get through the snow-covered roads. The New York Sanitation Department is denying the charges, but multiple sources of the Post list the ways that plow drivers are slowing the removal of the snow. Hopefully the people behind the slowup of the snow removal will be disciplined. They ignored the public safety issues which are supposed to be part of their job. That is not acceptable. If It Snows, It’s Global Warming, If It Doesn’t Snow, It’s Global Warming, What Happens If It Actually Gets Warm? I am somewhat amazed at the global warming people. They never seem to give up or be discouraged by the dishonesty in their research or by the evidence around them. The website WattsUpWithThat.com posted an article today about past attempts by climate scientists to predict the impact of environmental events on the earth’s climate. The example used is the eruption of Mount Pinatubo in 1991. The article contrasts the predictions with what actually happened. Why do we still believe these people? Why in the world are we still taking these people seriously? Yesterday Power Line posted an article about some of the early problems with Obamacare. The feature that is currently turning out to be not what it was supposed to be is the provision that provides for the care of people who are already sick who want to sign up for health insurance. The problem is twofold–no one is signing up and the program is proving to be much more expensive than initially thought. “As to the first matter, the chief actuary of the Medicare program predicted earlier this year that 375,000 people would sign up for the new pool plans by the end of 2010. As of early December, only 8,000 people had enrolled. Didn’t Nancy Pelosi say that the more we learned about the healthcare reform bill, the more we would like it? It seems as if the exact opposite is happening! Sounds like a typical government program to me! Today’s Boston Herald posted an article today about the arrest of terrorists plotting to attack the building housing the newsroom of the Denmark paper that published cartoons of the Prophet Muhammad. The plan was to shoot as many people as possible. Think about that statement. We need to remember that terrorists have no regard for innocent civilians who are victims of their plots–the innocent victims are seen as a positive part of the attack. These are the terrorists we are dealing with around the world. These are the terrorists who are currently in prison at Guantanamo. These are the terrorists who are desperately seeking nuclear weapons. It really doesn’t help you sleep at night to know this. “There have been at least four plots to attack against Jyllands-Posten or Kurt Westergaard, the artist who drew the most contentious of 12 cartoons, which were published by the daily in 2005 as a challenge to perceived self-censorship. Islam may want to be considered a ‘religion of peace’, but its track record tells another story. It’s time for Muslims who do not support terrorism to stand up and say so. If the moderate Muslim will not reclaim his religion, why should anyone accept the idea that Islam is a religion of peace? It seems as if no country in the world is safe from terrorism at the present time. This article is based on an article in The Jewish Daily Forward which was posted online on December 1. I came across the article through a link at Power Line posted yesterday. Rudy Boschwitz, former Senator from Minnesota, shares the story of how he came to America in 1935 as a five-year-old Jewish boy. His story is an example of how a father took responsibility for the safety of his family and did whatever it took to keep his family safe. Eli Boschwitz’s decision saved the lives of his immediate family. They left Germany in July 1933. It was two years before their journey led them to England where they received permission to come to America. The part of Mrs. Boschwitz’s story that amazed me was how far the Nazis were willing to go to hunt down and kill Jews. Senator Boschwitz served on the President’s Commission on the Holocaust and helped arrange for the allocation of land in Washington for the establishment of the United States Holocaust Memorial Museum. I have been through that museum–the suffering represented is overwhelming, but the courage shown by the victims of the Holocaust is inspiring. During the weekend of May 24 and 15, 1991, more than 14,000 Ethiopian Jews were transported to Israel on 34 El Al planes. Thank God Senator Boschwitz was willing not only to learn the lessons of history, but to put those lessons to work in saving the lives of other people who were in the same situtation he was once in. As oil approaches $100 a barrel and the price at the gas pump crosses the $3 per gallon mark, we need to take a good look at what we are doing to develop our own natural resources. We also need to admit that until something better comes along, we are a carbon fuel based economy. The Spanish found out that when they tried to convert to a ‘green’ economy, they had to abandon the effort because it was too expensive. We need to learn from their experience. Chron.com reported yesterday on the efforts of Houston-based ATP Oil & Gas to get a permit to drill a sidetrack off an existing well — a relatively low-risk proposal for the world of deep-water drilling. It was even revised and updated to meet all of the new requirements imposed on deep- water permits in the wake of the Deepwater Horizon accident. “More than 70 days later, the company is still waiting. At a price of about $330,000 per day, Bulmahn has started to get impatient, leading him to take some actions unusual for the company. “First, ATP hired Washington, D.C., lobbyists for the first time to help push its cause. “”I usually look with great disdain on lobbying efforts,” Bulmahn said. “And on Sunday he ran the letter as an advertisement in the Chronicle. Many in the oil industry believe that there is a de facto moratorium on Gulf drilling since the oil spill. The area was opened up in October for drilling, but only a limited number of permits have been approved. The result of this failure to develop our own natural resources is increased dependency on countries that are financing terrorism, an unfavorable trade balance, and high unemployment in our own country. We need to be wise in how we develop energy–we need to protect the environment, but we also need to understand the world we live in and its economic realities. Yesterday the Naperville Sun posted an article about a quadriplegic who is on the road to being able to walk. Bill Orr was injured in a motorcycle accident in 1986. He has been a quadriplegic since the accident. “Orr had known the appointment would be positive. That’s because it now hurts to comb his hair, the result of “more sensation in my body.” Plus, he can now do 200 sit-ups and pushups, as well as 20 leg squats in the therapy pool at Delnor Hospital in Geneva. Please note–this is not embryonic stem cells–these are cells from Mr. Orr’s own body–there is less chance of rejection, and there are no ethical questions regarding unborn embryos. “The enthusiasm is bigger than Bill Orr, however. Dr. Grekos believes stem cell therapy has the potential to revolutionize medicine, but it’s not going to happen through the FDA or pharmaceutical companies. “It’s going to take a grass-roots movement,” he said. I wish Mr. Orr the best in his recovery. May he be able to do everything he could do before the accident in the very near future. He reminds us never to give up–you don’t know what is waiting for you around the next corner. There are two sources for this article–one is a New York Times article posted on December 25th, the other is an article by Thomas Sowell posted at Townhall.com. Both articles deal with the Obama Administration’s placing a provision in Medicare that Congress had taken out of the healthcare reform act because it was too controversial. If Congress defeated it, why is it back? “But if law is not a body of rules, what is it? A set of arbitrary fiats by judges, imposing their own vision of “the needs of the times”? Or a set of arbitrary regulations stealthily emerging from within the bowels of a bureaucracy? The next session of Congress is going to begin with a reading of the U. S. Constitution. It’s time all members of Congress (and the President) took the Constitution seriously. Yesterday’s Washington Examiner posted an article on the impact on unemployment that the Obama Administration’s ‘green policies’ are having. The article reports that Department of the Interior Secretary Ken Salazar “has invented out of whole cloth a “Wild Lands” designation that entirely circumvents the congressionally sanctioned process.” According to the Constitution, Congress has exclusive authority to manage U. S. public lands. The wilderness areas, national parks and other public lands are overseen by the Department of Interior because Congress has given them that authority. Hopefully one of the first moves of the new Congress will be to reclaim the U. S. Constitution. Today The Hill posted an article listing the five things to watch in energy policy during the coming year. 1. As the Environmental Protection Agency (EPA) moves to tighten restrictions on greenhouse gases, the Republicans in Congress will move to limit the EPA’s power. Senator John Rockefeller’s (D-W.Va.) has previously tried to delay the EPA’s authority to regulate greenhouse gases and failed, but this year he will have a Republican majority in the House and more Republicans in the Senate to help with his efforts. West Virginia is heavily dependent on the coal industry for its economy, and the EPA regulations would have a serious impact on the state’s economy. 2..The continuing impact of the Gulf Oil Spill will also be an item on the Congressional agenda. Under current law, the financial penalties levied on the companies involved will go back to the federal government, There will be a move to send the money back to the Gulf region where the damage was done. Senator Mary Landrieu (D-La.) recently stated that she wants 80 percent of the penalties to go to the Gulf region. 3. Can the Republicans and President Obama find common ground on energy policy? OPEC stated recently that it’s goal was oil prices at $100 a barrel. As Americans watch that price reflected in the cost of heating their homes and at the gas pump, there will be a cry for developing domestic oil resources. As prices rise, Congress may be forced into allowing offshore drilling permits to be issued. 4. The Sierra Club and The Environmental Defense Fund are already making plans to see tougher limits on greenhouse gasses put in place. They were not happy with their progress in the last Congress and are planning to take a more ‘confrontational stance.’ There will be a battle as to whether or not man-made climate change is real. 5. Our relationship with China in regard to green energy will be complicated this year by China’s green tech trade practices. The November elections are not only going to have an impact on taxes and spending–there are many energy issues that will be part of the debate in the coming year. Since smokers have been reduced to huddling in freezing doorways outside restaurants and work places, some people have turned to electronic cigarettes, either in an effort to quit smoking or to smoke without creating second-hand smoke. The electronic cigarette industry’s annual sales are estimated at more than $100 million. To the government, an unregulated industry with $100 million in sales is like waving a red flag in front of a bull. The Wall Street Journal reported on this story on December 21. “The appellate panel ruled that e-cigarettes should be regulated as tobacco products by the FDA, unless marketers make specific claims that the devices help smokers quit or provide other remedies. My belief is that when dealing with the government, “follow the money” is the rule. Electronic cigarettes are not subject to the same taxes that regular cigarettes are–therefore the government does not make the same amount of money when they are bought. In 2009 Congress passed the State Children’s Health Insurance Program (SCHIP), which increased the tax on cigarettes $0.61 per pack or $10.07 per carton. Meanwhile, your taxpayer dollars still pay subsidies to tobacco farmers! I have a suggestion for Congress if they are looking for something in the budget to cut! This is a story to watch. How much control of our lives are we willing to give the government? And have federal agencies overstepped their bounds in what they are attempting to control? It’s very fashionable right now to speak out against ‘Blig Government’, but exactly what does that mean? Well, the American Thinker posted an article today that really shows the damage a well-meaning federal bureaucracy can do. During the Great Depression, farmers simply walked away from their farms and left the land untended. In the midwest and prairie states, the untilled soil was picked up and carried by winds and the area became known as the Dust Bowl. These are the people who are going to be in charge of our medical care? I hope not. Yahoo News posted an Associated Press story about the Christian churches in Iraq that are not celebrating Christmas this year. “Christians across Iraq have been living in fear since the assault on Our Lady of Salvation Church as its Catholic congregation was celebrating Sunday Mass. Sixty-eight people were killed. Days later Islamic insurgents bombed Christian homes and neighborhoods across the capital. There is a picture in the article of American soldiers guarding a church during a Mass in Baghdad. Please pray for the persecuted church around the world and thank God for the blessings we have in America that allow us to celebrate Christmas without fear. What Does The START Treaty Say ? Hot Air reported yesterday on what the Russian media is saying about the START Treaty, recently passed by the Senate. This is the linking that Ronald Reagan consistently avoided in his negotiations with the Russians. The American missile defense program is what essentially brought the Soviet Union to its knees–they simply could not keep up–they didn’t have the money or the technology. Now President Obama has given away our advantage in that area at the same time North Korea, Iran, and Venezuela are aiming missiles at America. Several Republican-authored amendments to the treaty that sought to alter the preamble were voted down, based in part on assertions that the preamble had no legal standing. It seems to me that what we have here is a failure to communicate. The article at Hot Air points out that the Russian Duma also has to ratify the treaty. It will be interesting to see how the Duma will react to the American idea that the treaty does not limit missile defense. This story is based on two sources–a Power Line article from yesterday and an article at News10 in Sacramento, California. An airline pilot who was concerned about airport security posted videos on YouTube showing lapses in security at San Francisco International Airport. Parts of the video he posted can be seen at the Power Line article linked above. “Three days after he posted a series of six video clips recorded with a cell phone camera at San Francisco International Airport, four federal air marshals and two sheriff’s deputies arrived at his house to confiscate his federally-issued firearm. The pilot recorded that event as well and provided all the video to News10. “At the same time as the federal marshals took the pilot’s gun, a deputy sheriff asked him to surrender his state-issued permit to carry a concealed weapon. “He has worked for the airline for more than a decade and was deputized by the TSA to carry a gun in the cockpit. This sounds like a stable, contributing member of society who does not deserve to be hassled by the government. The video at Power Line also reports that the pilot’s County Sheriff has also revoked his concealed carry weapons permit. It seems to me that during the Bush Administration whistle blowers were considered a good thing. At any rate, this seems a bit heavy-handed and I hope the new Congress will take a look into the matter in January. The video at Power LIne also points out that the airline the pilot works for has asked him to remove the videos from YouTube, but he is not being disciplined by the airline in any way. The government is also reviewing the pilot’s status as a Federal Deputy. That is a voluntary position, and the pilot could continue to fly without being a Federal Deputy. The 9/11 First Responders Bill has finally passed in the lame-duck Congress, and thankfully that Congress has gone home. But have you wondered what the problem was? We all want to help those who were impacted by that horrible day, what was the delay? (WASHINGTON, D.C.) – U.S. Senator Tom Coburn, M.D. (R-OK) released the following statement today regarding an agreement on the 9/11 bill. “I’m pleased the sponsors of this bill agreed to lower costs dramatically, offset the bill, sunset key provisions and take steps to prevent fraud. Every American recognizes the heroism of the 9/11 first responders, but it is not compassionate to help one group while robbing future generations of opportunity. I’m pleased this agreement strikes a fair balance and improves the bill the majority attempted to rush through at the last minute,” Dr. Coburn said. • Reduction in Costs. This agreement saves taxpayers $6.2 billion from the substitute amendment and $7.5 billion from the House-passed bill. In the deal, costs are reduced to $4.2 billion in the 10-year window and eliminated outside the 10-year window. Of that amount, $1.5 billion will go to health benefits, while $2.7 billion will go to compensation. • Permanently Close the Victims Compensation Fund (VCF) after 5 years. The original bill kept the VCF open through 2031, making it extremely susceptible to waste, fraud and abuse and incurring significant long-term costs. The fund is now open only through 2016 and has language to expressly say that it is permanently closed at after 5 years. • Prevents Reinstatement of Civil Claims. Prevent claimants who are rejected from the VCF from then pursuing a civil lawsuit. This is consistent with the earlier VCF policy. • Limitation on Infrastructure Costs. Explicitly excludes construction and capital projects from health care spending in the bill. • Commitment to ensure eligible individuals cannot “double-dip” on benefits. The Senators all agreed to get in writing from the Special Master that he will include workers compensation benefits in collateral sources of benefits that he must offset from potential compensation awards. • More Accountability. Require claims-level data reporting to provide accountability and opportunity for oversight, as well as GAO reports to determine less expensive mechanisms to provide nationwide care, pharmaceutical access, and health information technology promotion. The thing to notice here is that the reduction in cost did not reduce the benefits to the victims–it reduced the lawyers’ fees. The lawyers’ lobby is one of the major contributors to Democrat election campaigns. If Senator Coburn had not fought for this change, the taxpayers would have paid very large sums of money to lawyers rather than victims. This is the kind of scrutiny and changes that any bill coming before Congress needs to be subjected to. Thank you, Senator Colburn for standing strong to make this change. The Sydney Morning Herald reported today that Britain is preparing to confer diplomatic status on the Palestinian delegation in London for the first time. “Meanwhile, the Palestinian leadership has stepped up its efforts to win European recognition for a state on land occupied by Israel in 1967. The recognition of a Palestinian State without that Palestinian State acknowledging the right of Israel to exist is not a good thing. All that has happened is that a group of people dedicated to wiping out the state of Israel have been made legitimate on the world stage. That is not a recipe for peace. What Does The Census Mean ? Michael Barone is known as the final word on political demographics. He posted an article at Townhall.com on his interpretation of the recently announced census results. Mr. Barone points out that the northeast and California, both of which had been growth centers during the 20th Century, have lost that distinction to Texas. “Its (Texas) population grew 21 percent in the last decade, from nearly 21 million to more than 25 million. That was more rapid growth than in any states except for four much smaller ones (Nevada, Arizona, Utah and Idaho). If the states are to be considered ‘laboratories for government policies’, there are lessons to be learned here–tax policies and legal policies matter. “Finally, let’s get to politics. The net effect of the reapportionment was to add six House seats and electoral votes to the states John McCain carried in 2008 and to subtract six House seats and electoral votes from the states Barack Obama carried that year. Similarly, the states carried by George W. Bush in 2004 gained six seats, and the states carried by John Kerry lost six. As I said, Mr. Barone is the expert on how elections work in regard to districts and states. It will be interesting to follow his comments as redistricting of the states begins. The Obama Administration has not been at all even handed in its dealing with Israel in the Administration’s quest for peace in the Middle East. That is not the reason the process had fallen apart–there will not be peace in the Middle East until both sides acknowledge the right of the other side to exist. Until that hurdle is overcome, true peace is not possible. Now the President has a chance to do something good for Israel and for America. The Jerusalem Post reports that Prime Minister Binyamin Netanyahu will ask President Obama to release Jonathan Pollard, an Israeli spi who has been in prison in the United States for 25 years. “Netanyahu will issue a public, formal and official call in upcoming days for Obama to release the Israeli agent , the Prime Minister’s Office announced in a press release Tuesday. It’s interesting to note that Jonathan Pollard, who was spying for a country that is supposed to be a strong ally, has been held longer than any spy from a country that is not considered friendly to the interests of the United States. “Life imprisonment is apparently the harshest punishment ever meted out to someone found guilty of spying during peace time. Indeed, since the execution of Julius and Ethel Rosenberg in 1953, during the Korean War, no spy has received a harsher sentence, even during war time. The severity of Pollard’s sentence is in itself noteworthy. Some of the information I have found on this case indicates that Mr. Pollard was supplying Israel information on its enemies that the United States had, but had not shared. He was not simply spying to sell damaging information to our enemies–he was trying to help Israel survive the continuing attacks from its neighbors. Unless the classified documents surrounding his conviction are made public, we will never know the true reason for the harsh sentence. Until that happens, I think the best thing to do is free Mr. Pollard and send him home to his family. Israel is not an enemy of the United States, and we need to treat them as friends–not adversaries. On Monday the Daily Caller reported that New Jersey Governor Chris Christie commuted the sentence of Brian Aitken–reducing his sentence from seven years in prison to time already served. Brian Aitken was sentenced to prison because in 2009 police found unloaded guns in the trunk of his car. The guns had been purchased legally in Colorado where Mr. Aitken lived. The guns were properly stored and unloaded. Mr. Aitken was in the process of moving his household to New Jersey to be closer to his son and had not yet registered the guns in New Jersey. On the surface it seems as if this man is no threat to society. His true crime may have been ignorance of the law or procrastination. Moving from one state to another is not usually all that complicated, and Mr. Aitken may have simply not gotten around to registering his guns. He was used to living in a state where gun possession is more common than it is in New Jersey. Why did New Jersey intend to spend taxpayers’ money to keep a man who was making a positive contribution to society locked up in jail for seven years? I am glad Governor Christie has commuted this sentence. There are some good pictures of the lunar eclipse posted at the UK Telegraph website. Enjoy. My source on this goes back to the beginning of December, but the issue is still with us. On December 1st, a website called The Other McCain posted an article on the Pigford Settlement Project. “Congressman Steve King (R-IA) today issued the following statement after the lame duck Congress passed legislation appropriating $1.15 billion to fund the controversial and fraud-plagued Pigford settlement program. Although estimates suggest that the total universe of black farmers who could qualify for Pigford compensation only encompasses 18,000 people, over 94,000 people have submitted claims under the program. The Pigford funding request was included in H.R. 4783, the Claims Resolution Act of 2010, which passed the House of Representatives on a 256-152 vote yesterday afternoon. Congressman King voted against the legislation. More information on the fraud involved in the Pigford project can be found at Big Government. As America faces a debt crisis, fraud in government is one of the more painless ways to cut spending. Let’s hope the incoming Congress is willing to investigate the Pigford settlement program thoroughly.